Christian, please introduce your team in few words. When and where have you founded the club? How many members do you have? How long are you involved in the (beach)handball activities? We have collected a team of players who is selected for the big national team squad this year, and we want to play these international tournaments to improve as a team, but also as individuals. As a bonus, it’s important for us to compare our level with the other teams. All the players representing our team, has been playing beach handball since the beginning of the sport in Denmark, so it’s going to be exciting to see where we stand towards the elite of club teams in European beach handball. We know that Jarun Cup has a great reputation. What are your achievments so far? Our achievements so far haven’t been any as a team. But some of our players have been representing the national team, and has also won the national championship a couple of times. You are representing your state on this tournament, so are there any strong sponsors or media to help the team to promote you (some sport magazines or TV)? Is beach handball a popular sport in your state? How many teams play beach handball in your country? 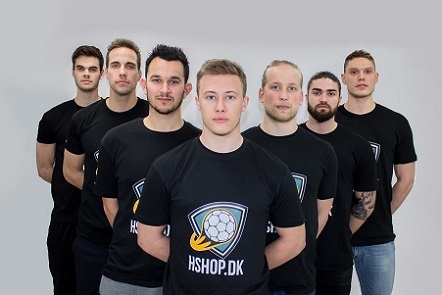 We have one great sponsor which is Hshop, that sells handball gear primarily in Scandinavia, and are one of the biggest companies regarding handball gear. Overall, beach handball is an upcoming sport, and we’re trying to spread the word regarding this amazing activity. The Danish Handball Federation decided to reestablish the national teams again, which is a huge step towards getting people out on the beaches and try the sport. Denmark should belong to the elite of national teams, but we’re very humble of the upcoming tasks for the national teams this summer. This regards the women team too. More than 2000 teams have been playing beach handball in Denmark, for last few years, and the number of teams are still growing. Where do you have trainings? How many courts are per city? Do you use maybe indoor courts during winter? We come from different cities, and we train as often as it’s possible. Most of the time we have training sessions in Skæring, near Aarhus. The four courts in Skæring, have a very high quality of facilities, and they allow us to go and practice when we want to. We have a few indoor courts, but in Denmark the beach handball players, mostly play indoor handball as a main sport. Do you, as a team, play only beach handball or do you play also indoor handball and just play together during summer? Is there any professionall players in the club that are living from handball/beach handball? We as a team, only play beach handball together. As individuals, we represent different teams in the Danish and Swedish league and first division. Nearly half of the players of the team, have handball as a full time job. How is the national championship organised in your state? The national championship is organized by six qualification tournaments, and a final tournament. The 10 best ranked teams from both men and women, play a final tournament (the national championship). The qualification tournaments are spread around the country, so everyone has the chance to participate in a tournament. There are great tournaments in your country. How many tournaments do you have? Which tournament is the best? We do believe that the level of beach handball is high in Denmark, because we have a tradition to bring our kids to beach handball trainings, at a very early stage, and they develop knowledge about this sport. That makes Danish kids able to understand the game, the tactical aspects, and technical abilities and a young age. Besides the national championship, we have a countless number of tournaments for kids and amateurs. What do you expect from the Danish national selections, and what was the reason that you were absent after 2014 World Championships? We were absent because of financial priorities in the Danish Handball Federation, and sadly they removed the national teams. But in the previous years, they have seen which huge steps beach handball has taken, and that this is just the beginning of something big. Plus the fact that we had 3 players on the world allstar team in Switzerland, Lausanne also indicate that we need a national team in Denmark, because we believe that we’re good at this sport. At the end, what are your expectations for the upcoming tournament Jarun cup? We try to stay as humble as possible, so our expectations is that we will participate in a tournament, where we get the chance to meet some of the best players and teams in the world. Hopefully we will be able to win a couple of matches, and we will do our best to represent well Danish team for the first time at Jarun Cup. We would like to thank for the opportunity at Jarun Cup, and we’re looking forward to play this amazing tournament, and play against some of the best teams in Europe. We would like to thank you that you chose to become a part of our Summer story this year. Good luck and see you soon.